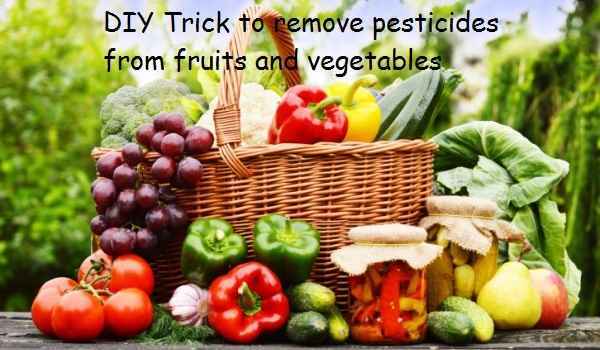 To remove Pesticides from Fruits and Vegetables is the biggest challenge today. Fruits and vegetables are the catalysts to maintain and improve our health. Most of them are rich in nutrients like minerals and vitamins that help us fight against various health diseases and heart-related disorders. But with the advancement in organic farming, the usage of chemicals in the form of weed killers and pesticides has increased. These chemicals help to get a better yield in a shorter span of time. How to wash Fruits and Vegetables in order to get rid of chemicals and remove pesticides? Many commercial washes are available in the market, but is there any natural way to get rid of these pesticides? The answer: Of course there is! This technique works well when you are washing the fruits and vegetables in bulk. Fill a sink with water and white vinegar in 3:1 ratio. Experts from Environmental Working Group Claim that acetic acid present in white vinegar has the capability to kill 98% of bacteria and dissolves the wax and other chemical residues present on the skin of fruits and vegetables. Fill the sink or a large bowl with water and vinegar solution and stir well. Add the fruits and vegetables (kept at room temperature) into the wash. Keeping the temperature same of both water solution and fruits and vegetables will reduce the risk of a shock for soft-skinned fruits and vegetables. Allow them to soak for 15 minutes. Air dry them or wipe them using a fresh towel or a soft cloth. You can also give them an extra rinse with purified water. Take a spray bottle and add 2 tablespoons of white vinegar, a cup of purified water and 2 tablespoons of lemon juice. Spray the wash generously on the produce. Rub them by hand for around 20-30 seconds or you can also use a vegetable brush. Rinse them thoroughly with water.